Summary for the Busy Executive: Trumpet hi-jinks and more. Lately, I've been getting a lot of miscellaneous recital discs from the MSR Classics label, an independent based in Connecticut. I have little idea whether MSR does anything other than distribute the recordings produced by the artists themselves. In any case, it seems to specialize in this kind of recording, and often the recordings rise above the usual, even above those of better-known artists. Eric Berlin, principal trumpet with the Albany Symphony, teaches at the University of Massachusetts, Amherst. Indeed, this disc constitutes a U. Mass. old home week, since every other performer on the disc teaches there as well and that's where they recorded. The disc is notable for two reasons: program and performance. Outside of modern composers, very few of the generally-acknowledged "greats" wrote for solo trumpet, so the enterprising players have usually energetically pursued commissions. I have generally observed that most composers seem to come out of the music prominent in their teens and twenties. All but two of those here, Charles Bestor and Salvatore Macchia, are in their forties. The music of Macchia (63) and Bestor (a remarkable 86) differs from the rest in outlook. Bestor, despite the use of electronics, seems to me closest to classic Modernism. The electronic sounds aren't the music from Pluto, but tweaks to standard instruments. Macchia sounds pretty much like the composers of the Sixties and Seventies. On discs of mostly unfamiliar music, I usually like some works better than others, and that holds here. Macchia's End of the Matter, the longest piece at 19 minutes, could have used some trimming, despite some arresting moments and a beautiful, even poetic, end. Michael Ellison's Elegy is solidly written, but not all that interesting. I enjoyed Robert Bradshaw's sonata, even though it failed to surprise me. James Stephenson's witty Vignettes invigorate: wild chases or dances that make you want to move. The music is filled with quirks and twists. The trumpet usually moves against a single percussion instrument for most of the sections. For example, "Chasing Igor," one of the suite's high points, pits trumpet against snare drum. "Leandro Perpetuo" gives the percussionist a marimba solo, while in "Chuck's March," a panoply of percussion accompanies the trumpet. Clearly, Leandro impressed Stephenson as much as Berlin. Bestor's Concerto Piccolo takes a Baroque genre and updates it with an electronic accompaniment. This results not in the usual boops and squeaks, but in a broadly neoclassical idiom. As I've said, the sounds themselves relate to standard instruments. 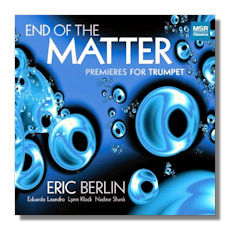 In the first movement, the solo trumpet is supported by a bed of "brass." with discreet bell-like sounds. The slow second movement features an orchestra of "strings" and "winds." In the last movement, the accompaniment is mainly "brass and percussion," with an "electric guitar" thrown in. Beyond the surface, however, one finds beautiful music. Evan House's divertissement Street Jam for trumpet and bongos (!) fully lives up to its title. It overflows with the good energy from the streets, and the music seems to derive from Latin-American trumpet music. All the performers are excellent. Although what I know about brass technique comes down to two unhelpful sentences, I can say that Berlin has a bright, clear tone, hits no clams, has a vigorous approach to rhythm, and the musical brains to understand the goals of very different pieces. Leandro, his principal accompanist, amazes me in his sensitivity to his partner and his apparently effortless virtuosity. Saxophonist Lynn Klock has the misfortune of playing in one of my least favorite items on the program, but he plays beautifully, with a horn-like tone and a beautiful sense of line. Pianist Nadine Shank gets very little to do, but does it very well. Copyright © 2010, Steve Schwartz.